Three slabs of soft pine wood with natural sisal knots tied on both sides. Hangs on natural sisal on wide mouth stainless steel quick link. About 12" wide. 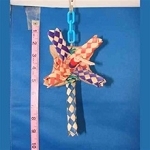 Great preening and chewing toy for medium to large birds. 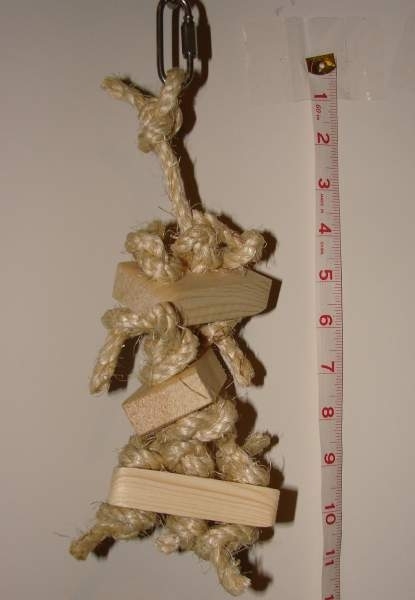 I ordered the sisal and pine toy with knots for my Timneh Grey, Charlie. He sure likes it. My 20 yr old African Grey LOVES this toy! He recently started to feather pluck only the feathers on one of his legs - not a lot but enough for mama to notice. Immediately got online and find this website which I LOVE! Can't find anything like these toys local -- ordering 2 more of these toys to have on hand along with other toys to try so he will stay busy during the day!